Yes, she is my heroine and she would be yours too if you knew her. I want to be just like her when I grow up—oops, too late for that! Well then, I want to be just like her when I am her age–78. This post is only remotely related to sewing, but we all need inspiration and Aunt Rheeta is mine. Her most recent activity spurred me to write this post. She is one amazing woman. 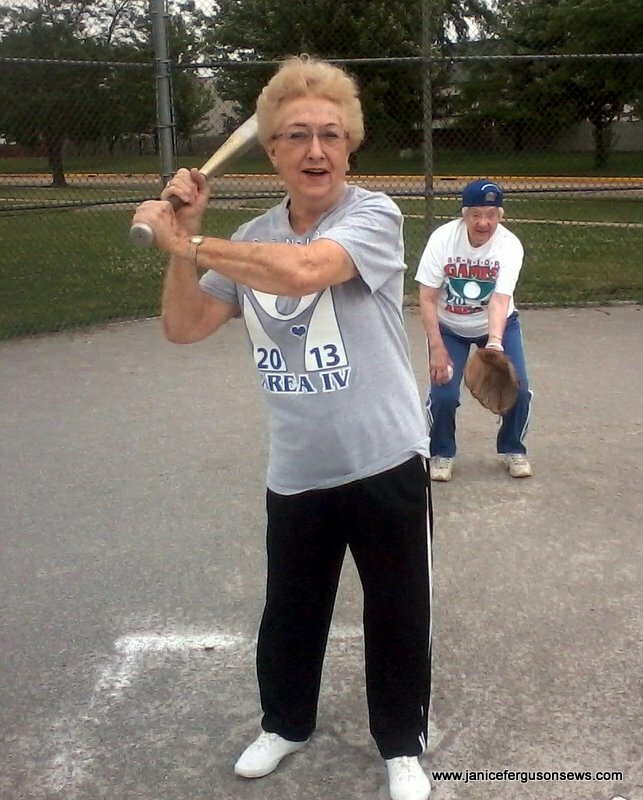 Her friend Laura, the 88 years old catcher (!!!! ), is one of the few who can keep up with her. Yes, Aunt Rheeta hangs with a tough crowd. I think she said Mickey Mantle was her coach. At the age when so many people are winding down, or have long since finished that process, my fit, fun Aunt Rheeta lives her life full steam ahead. 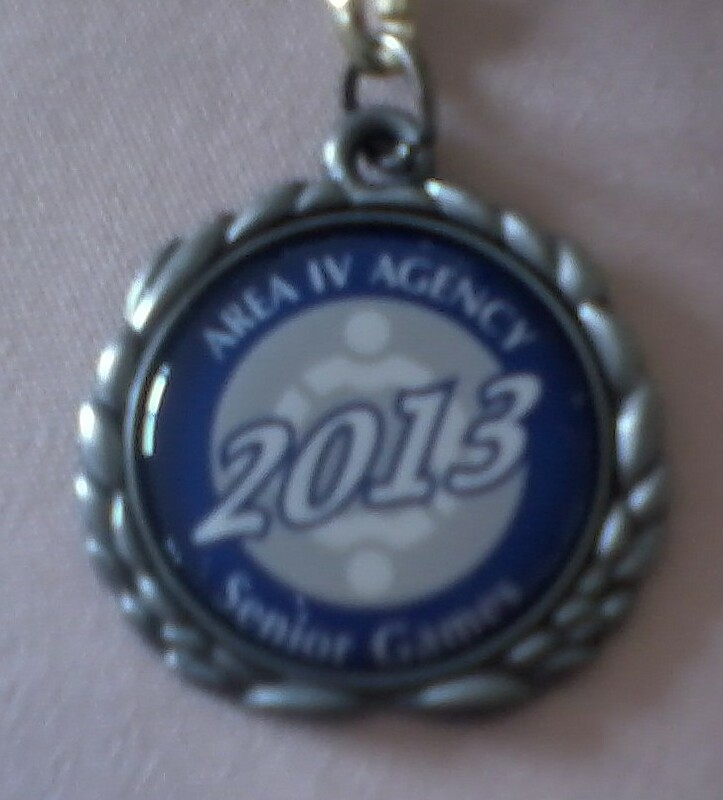 Now she is a medalist in the Senior Olympics where she competed in baseball, bowling (averaging 126!) and horseshoes. 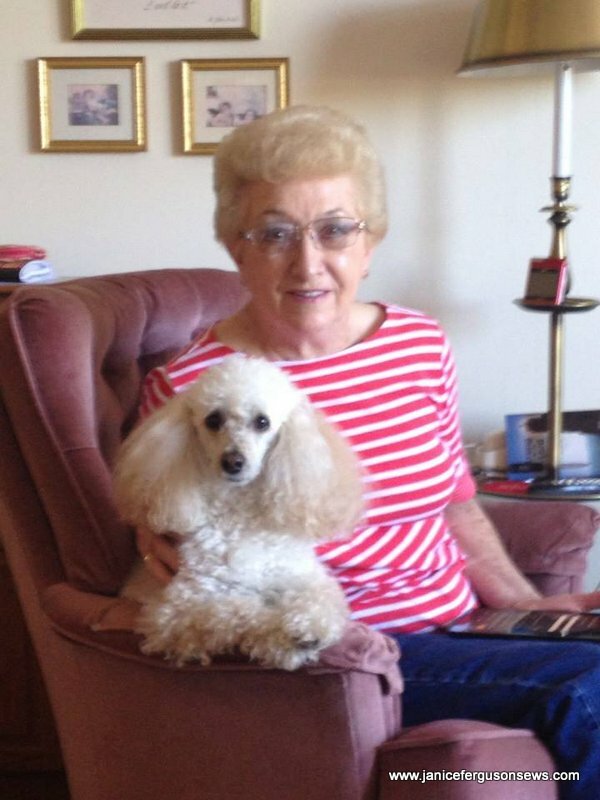 Even when she is not in training, she regularly walks her little poodle, Molly, through a lengthy loop in the park near her home. 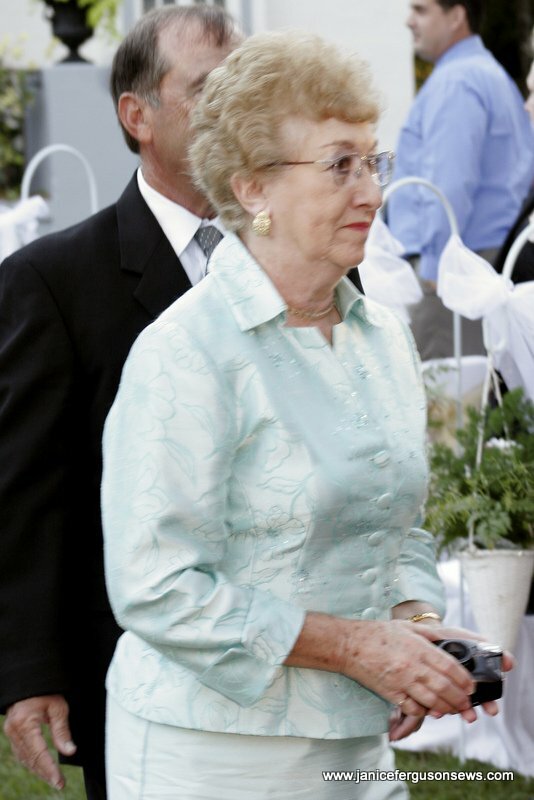 A devout Christian, she raised four fine children by herself, two of whom are ordained pastors. 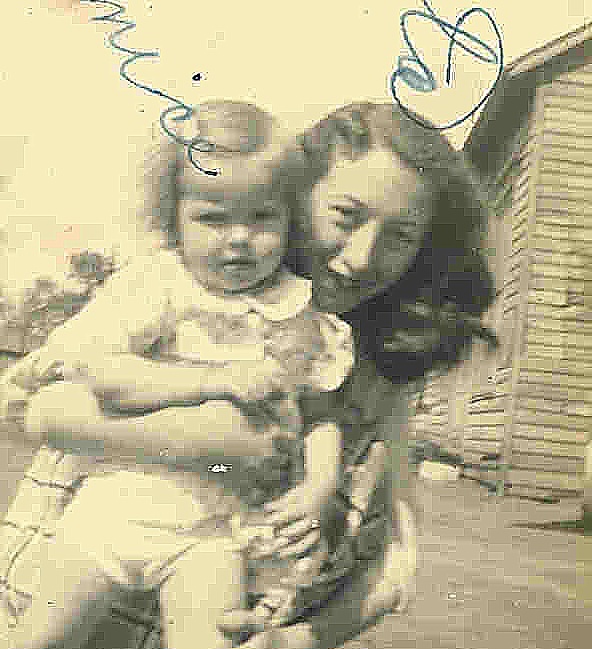 After her children were grown and on their own, she sold her home and all of her possessions to serve as a missionary in the Soviet Union. It has been years since she left the foreign mission field, but still she cooks and delivers meals to the sick, visits shut ins, cleans the church when her turn comes up, hosts prayer meetings in her home and serves the church as an elder. It is apparent that she has never abandoned her life of Christian service. In her late 60’s, she sat before a sewing machine for the first time in her life (FINALLY a sewing link!). 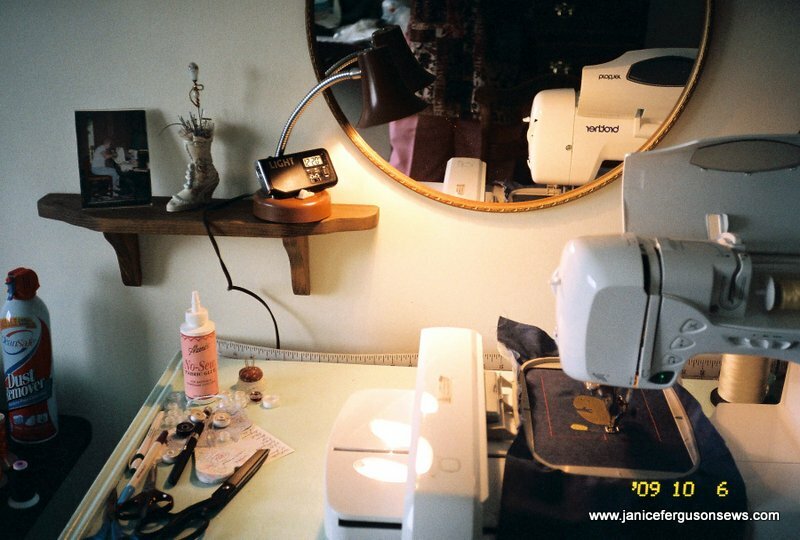 With my Brother 8500, she fell in love with machine embroidery and soon was the owner of her own machine. One of her loveliest projects was a spectacular Bible cover. She went on to stitch a breathtaking communion cloth for her church. The photos I took are terrible, but the cloth is just gorgeous. 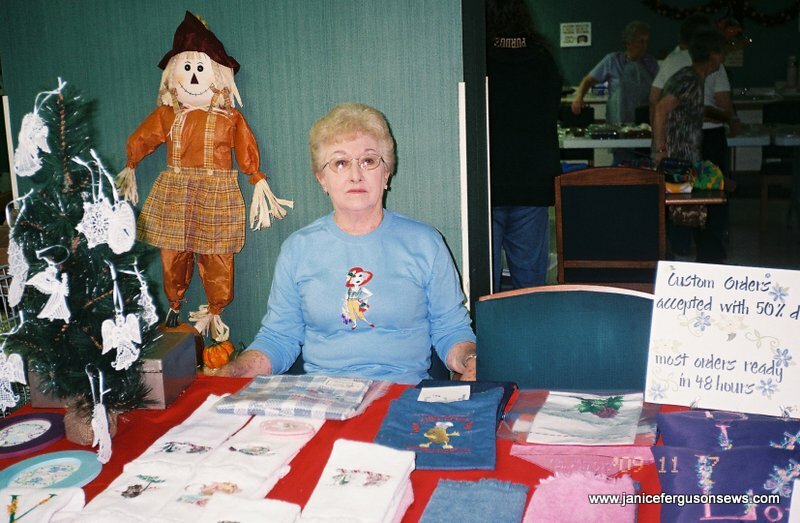 She didn’t stop there—she even had a booth at a few craft shows to sell her goods. Remember, this is a skill she learned long past retirement age. Nothing stops her, nothing intimidates her. 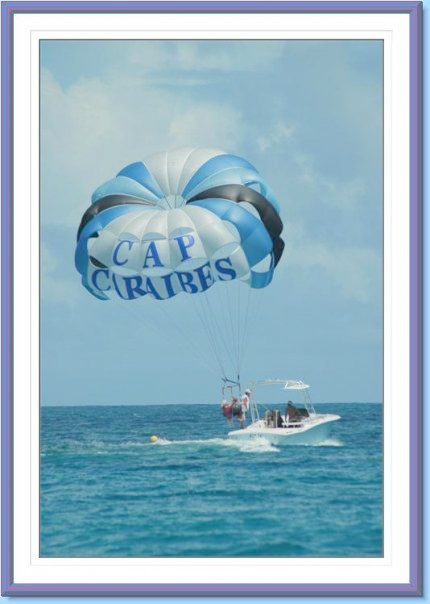 Parasailing in the Caribbean gave her pause, just because she cannot swim. But what the heck! With a life jacket what could happen? Sharks? Ha! She laughs at sharks! Can you see why she is my heroine and a great role model for all who know her? Wouldn’t the world be a great place if it were filled with Rheeta copycats? Aside from being my aunt, she is one of my dearest friends We have always been close. Am I lucky or what? I can see why you are inspired by your wonderful Aunt!! It makes me tired just reading all she does. How nice to be so active as one ages! I hope I am the same. Oh my goodness, there is no stopping her! What an inspiration! You are lucky to have such an interesting, adventurous, and just plain awesome aunt! Thanks for sharing her story with us! She is amazing, Lisa. But she shrugged off any praise, saying it runs in the family. Her brother, my Uncle Richard, is fit and vigorous at 92, still maintains his meticulous 5 acre woodland garden and just married for the 3rd time, having been lonely widower twice now. I hope I have those genes. She certainly is awesome, Dorothy. I didn’t list even half of what she does, maybe because it makes me tired thinking about it! Wow,tired me out. She seems a wonderful and loving person. now i see who you take after. Thanks for sharing. Thanks for the huge compliment, Mabel. It would make me happy to be even half the woman she is. Judy, I’ve tried following her around but I always lose her in a cloud of dust! Rheeta Cooper Booth – the best! Thank you, Janice for this story! From Russia with Love, yours Yana. I’m so glad you read this, Yana. She thinks so much of you, but I doubt you knew about all the things she does.